Diamond, J. (1997). Guns, Germs and Steel. A short history of everybody for the last 13,000 years. London: Vintage Books, 480 pp. I grew up believing the Book of Mormon to be a true story. Jared Diamond’s book Guns, Germs, and Steel swiftly debunks this idea. Like the subtitle says, this book provides a general overview of the history of mankind. Diamond uses various scientific discoveries from different disciplines, with a focus on how they all come together in a coherent story. It is this coherence which deals the death blow to the Book of Mormon as history. Book of Mormon critics as well as Mormon authors often concentrate on certain details to make their case, like anachronisms or linguistic features. Guns, Germs, and Steel shows that the devil of Book of Mormon historicity is not just in the details. As it happens, the Book of Mormon can only be historical if everything we currently believe to know about the history of the New World is wrong. Possible? Yes. Likely? Not so much. This article contains a few insights from Guns, Germs, and Steel which challenge the idea of the Book of Mormon as a true story. This doesn’t do justice to the grand story Diamond is trying to tell but there is nothing to stop anyone from reading the book itself, which I highly recommend. You can also watch a two-hour National Geographic documentary about the book at the bottom of this page. Large mammals like elephants and horses had become extinct in the Americas by 11,000 BC (pp. 46-47). They are mentioned in abundance in the Book of Mormon (flocks, herds, cattle) but no evidence for their existence in the Amercias during Book of Mormon times has yet been found. This anomaly is larger than simply not having found horse bones or elephant tusks. The presence of large domesticated animals has a large impact on human societies that would be noticeable today even without the animals’ physical remains. Immigrants can bring crops from their homelands but plants from one climate don’t often do well in another (p. 55). According to the Book of Mormon, the Lehites planted seeds which they had brought from Jerusalem as soon as they had landed, which grew “exceedingly” well. For this to be likely, they would have had to have landed in central Chile or in California, as these are the only areas in the Americas with a climate comparable to Jerusalem’s (p. 139). While this considerably narrows down the area to search for Old World crops from Book of Mormon times, none have yet been found. Throughout human history, agriculture independently originated in only a handful of areas, each with their own domesticated crops and animals. In Mesoamerica, the most important ones were corn, beans, squash and turkey. In the Andes and Amazonia, manioc, potatoes, llamas and guinea pigs. In the Eastern United States, sunflower and goosefoot (pp. 99-100). Except for corn, none of these are mentioned in the Book of Mormon; for the plants that are mentioned, no evidence has yet been found. Another issue becomes apparent by comparing the two maps above: there is no overlap. The two most likely locations for the seeds which Lehi brought from Jerusalem to do well, do not coincide with the areas where we know agriculture actually did originate in the Americas. The use of large domesticated animals for pulling agricultural equipment like ploughs meant that farmers in the Old World could cultivate large, high-yielding monocultures. In contrast, there were no such animals available in pre-Columbian America so fields had to be worked manually and crops like corn planted individually (p. 128). Nevertheless, the Book of Mormon contains several references to large domesticated animals (“useful unto man”), as well as to high-yielding monoculture crops, for neither of which any evidence has been found to date. There was virtually no contact or migration between the cultural areas in the Americas because of the formidable the physical and ecological barriers between them (dense rain forests, swamps, mountains, deserts, different climates along the north-south axis of the American continent, see pp. 178-180, 187-188). The early Mormons – and many modern Mormons too – clearly believed that Book of Mormon events occurred throughout the Americas. Joseph Smith fancied himself “wandering over the planes of the Nephites” while traveling through the Midwestern US and identified a hill in Manchester, New York, as the hill where Book of Mormon character Moroni buried the golden plates. This brings us to another inconsistency. Regardless where the Jaredites and the Lehites landed, it is highly unlikely for such a small band of people to have grown and spread throughout the entire American continent to begin with, let alone in the short timespan of the Book of Mormon narrative. Even if we assume, as some Mormon apologists do, that the Book of Mormon peoples were assimilated by the indigenous American population, they would likely have stayed in one area. Since there was little to no contact between the various cultural areas in the Americas, there was no exchange of knowledge and technology either. This is why the wheel was known to the Maya but not used for transport because there were no suitable draught animals in Mesoamerica (p. 248). Meanwhile, just 1,200 miles south in the Central Andes, llama were domesticated by the Inca but they had no wheels (p. 262). 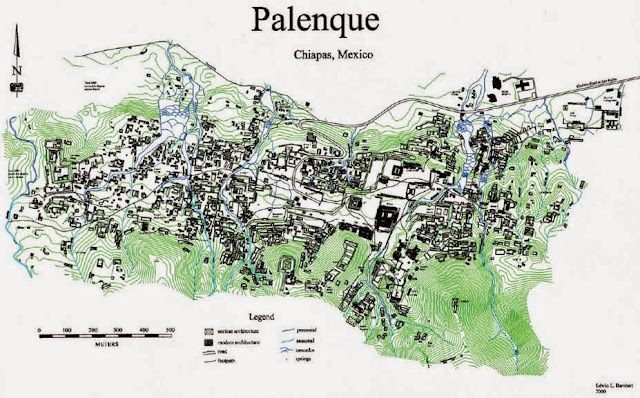 Palenque, a Maya city without streets (source). Not only were there no horses in the Americas, evidence for the existence of chariots as mentioned by the Book of Mormon is also non-existent. Moreover, it is highly unlikely that such evidence will ever be found. The combination of draught animals and wheels would have given rise to roads and travel, trade and migration. Even if no horse or chariot remains will ever be found, the effects of their existence would have become visible in a myriad of other ways. Writing only occurred in a small part of Mesoamerica (p. 215). At this time, the oldest Mesoamerican writing is thought to date back to ca. 600 B.C. – music to the Mormon ear – but shows no relation to any Old World writing system (p. 222). Mormon apologists spend a lot of time identifying traces of Semitic languages in the Book of Mormon, which is said to be an unknown mixture of Hebrew and Egyptian. Even if this research were legitimate, it would raise more questions than it would answer. Developing metallurgy takes hundreds of years because it requires several cumulative technological advancements. It might start with the discovery of a soft ore (e.g. copper or gold) at or near the surface, which can be hammered into shape. The next step would be the development of smelting technology, paving the way for copper alloys (e.g. bronze), and eventually iron and steel (p. 259). All of these technologies leave lasting traces, such as smelting and mining infrastructures. Such technologies also create developmental and strategic advantages for the societies possessing it, which would be visible in the archaeological record. The Book of Mormon mentions iron and steel very early on and maintains that these were used for buildings, tools and weapons. However, no evidence for such advanced metallurgy has yet been discovered in the Americas during Book of Mormon times. It is wholly absent from pre-Columbian North America, appeared in Mesoamerica after the Book of Mormon events, and in South America about half-way through the Book of Mormon narrative (though mainly for decorative objects in northern Peru, not buildings, tools or weapons anywhere). Mormon apologists sometimes complain about the lack of interest of non-Mormon scholars and scientists in the Book of Mormon as a true, historically accurate story. The reason for this is obvious: the likelihood of the Book of Mormon being a true story is just too small. This is not only because of what is in the Book of Mormon but shouldn’t be there, but also because of what should be in the Book of Mormon but isn’t. Today, scientists and scholars don’t need to become experts in Book of Mormon studies before they can make meaningful statements about it. The Book of Mormon as a true story in a pre-Columbian American setting simply does not rise above the level of a crackpot theory and, as history, can be legitimately dismissed prima facie.